LingQ : Ready to learn languages from the Godfather of language learning? Meet LingQ, an all platform language learning app that helps you learn 25+ languages faster using a unique approach. You start with regular easy lessons but quickly progress to learn new languages using authentic content. Discover more than 1000 hours of transcripted audio content for you to listen and follow along. LingQ even allows you to import your own content! Monitor your learning progress with powerful stats and review your vocabulary to strengthen weaker words. Best of all, LingQ lets you learn from any device as its data is synced online and onto your other devices. No other app will take you as far on your path to fluency! Learn up to 25 languages. Start with beginner lessons and progress to learning from authentic and even your own content. Create your own dictionary of vocabulary and track your learning progress on your way to fluency. 1000+ hours of original content. Get access to 1000+ hours of lessons, podcasts, books, interviews and more, all with transcripts for easier learning. LingQ even lets you import and learn from any content you find on the web. Improve your vocabulary. Create your own database of vocabulary using the integrated dictionary resources. You can also manage and review the vocabulary using the SRS review system. This way you can track how many words you know, which are new and so on. Monitor your learning progress. With LingQ you can view stats regarding your listening and reading time to see how much you’re studying. Set your own learning targets and measure your progress. See how your knowledge grows alongside your avatar. Study offline & sync. There’s no need to stay connected all the time, you can study offline and update your data when you are connected. You can also sync word, playlist and lesson data across multiple devices to learn at your convenience. Amazing app! First language learning app that actually works. After just a few days I noticed my ability in Spanish improving! I would recommend this to everyone I know learning languages. I am very glad I found it! 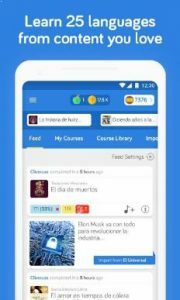 Great language learning app which makes it easy to learn by reading and listening. Perfect if you already know a little and want to expand your vocabulary. I’m in love, this app is a very good tool to increase your vocabulary and improve your listening and reading. I absolutely love what app is doing for my language learning! i love this app so much ! I really like this app so far and I’ve learned far more french than I thought in just a week or 2 of studying. However, there’s this really irritating bug that every so often will change the French pronunciation into an English pronunciation of the french word I want to know. It’s very inconvenient and I have to restart the app every time this happens so that it will reset and change back to the the french automated pronounication instead of the weird English one. Anyway I can fix this?? That does seem strange. Can you confirm that Google text to speech is the default text to speech engine on your device. You can do this in your device settings. It should work better if this is the case. If you are still having trouble, please report the issue along with your device type and os version to support at lingq dot com. This app is pretty good, the latest version of this is pretty attractive to learners that are visual too. Very good app. My only suggestion is that japanese should be written with kanji, to better teach the language.